In Liverpool’s last three matches, manager Brendan Rodgers has deployed a new wing-back formation. Despite losing against Manchester United in the League Cup, the Reds have beaten both Sunderland and Crystal Palace 3-1 in the Premier League. 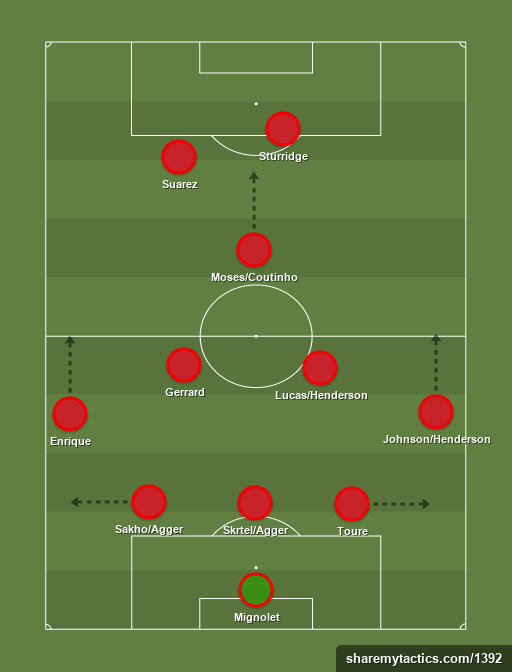 With the 4-3-3 formation Brendan Rodgers has typically used, one of either Suarez or Sturridge would have to play in an unnatural position from the left. With the new wing-back system however, the pair are both essentially deployed in striker positions. While they are free to roam to the flanks, and occasionally come deep to link up with midfielders, both are based centrally when the the team is in possession. This maximises their chances of scoring goals, and also means they can link up with each other more effectively. By playing close together, Suarez and Sturridge can read their strike partner’s movement, and continue to set up chances for the other with clever passes and intricate flicks. In the two Premier League matches since Suarez returned from his ban, the pair has scored five goals already. Following the summer arrivals of Kolo Toure, Mamadou Sakho and Tiago Ilori, and with the re-emergence of Martin Skrtel as a top level defender, Rodgers previously had the difficult task of selecting two defenders from five players who want first-team football. By playing three centre-halves, Rodgers has not only counteracted this problem, but he’s also maximised the strengths of his squad members. Sakho and Toure are technically accomplished, and play either side of the no-nonsense Skrtel. Sakho is an impressive passer of a football for a defender, and he drifts into the space left by Jose Enrique on the left-hand side of the pitch when the Spaniard roams forward. This allows Sakho to play the ball into the midfielders, or look long for a run being made by either Suarez or Sturridge down the flanks. Toure is similarly impressive on the right-hand side, which leaves Skrtel to do what he’s best at: defending. The Slovakian is less accomplished with the ball at his feet, and despite playing very well so far this season, could make way for Daniel Agger when the vice-captain returns to full fitness. Jose Enrique and Glen Johnson are undeniably very good going forward, but have been criticised in the past for their lack of defensive acumen. With three centre-backs behind them though, the fullback’s defensive frailties are less noticeable, and they are given the license to get forward at every opportunity and join in the the attack. Johnson is still out injured and hasn’t actually played in the formation yet, but is bound to fit in seamlessly when he returns after the international break. Jordan Henderson and Raheem Sterling have deputised in his absence, and have both shown great work-rate and speed down the right flank. Sterling was used against Palace at the weekend as Rodgers expected his side to have more of the ball, but against a better side, Johnson’s natural defensive instincts would be far more appropriate. When Liverpool have the ball, this formation becomes a fluid 3-4-3, and when they are defending, the wing-backs and the attacking midfielder drop deep, and it becomes a 5-3-2. This maximises both defensive and attacking numbers. Most importantly, it means the Reds can choose whether to focus attacks down either flank, or use the no.10 (currently Victor Moses, but likely Coutinho when he returns from injury) down the middle. This means their attacks are not predictable, and the talented players like Suarez and Sturridge have the freedom to use their natural ability to create chances and dictate play. Last season, Liverpool’s attacks would predictably go through Suarez, and this meant that despite his collection of goals and assists, he often gave the ball away. Now, Gerrard and Lucas provide a platform in midfield, and can pass to either onrushing wing-back, the creative no.10, or the dovetailing SAS combination up top.